For Emma and her cousins, life in Regency London is a whirlwind of lavish balls and dashing suitors. But, unlike other girls, they are not longing for marriage. A spell has been broken, a debutante lies dead at Emma's feet, frost clinging to her lifeless body, and a bright light is being cast into the cousins shadowy past. Now the girls must embrace the true Lovegrove Legacy - even if that means risking their own lives. Although, Cormac Fairfax, a member of the Order of the Iron Nail wants to help Emma, and she can't explain why. 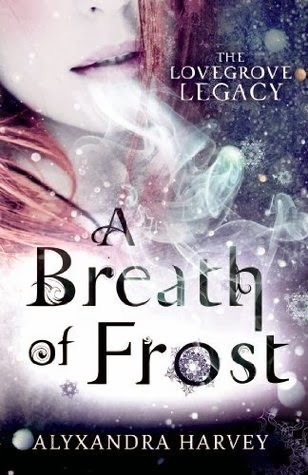 'A Breath of Frost' was a gorgeously-gothic and gripping novel, set in Regency London, filled with witchery, warlocks, spells and secrets . Admittedly, I was hesitant when I initially picked up this book. Not only had it come in the post without me realising I was receiving Alyxandra Harvey's latest, but it is nearly five-hundred pages long, and has quite a small-font. Reading the blurb, it sounded intriguing, although I was expecting to find yet another fantasy novel that focuses mainly on the romance, rather than the mythical-creatures and magic. I was proved wrong, despite a slow-start in the first few chapters. I adored this read, that combined multiple genres: fantasy, historical and romance, and still managed to have humour and wit. As a fan of Sarah J. Maas' 'Throne of Glass', this was perfect to curl-up to with the wintry-weather outside, and people who love the style of Cassandra Clare need to pick this up! Historical-fans, just like myself, are going to be championing this new trilogy. Regency London is intricately described: a world full of balls, seasons and finishing school. Add some magic to that, it's an extremely-detailed tale, where you soon realise things are not safe. Harvey's writing is so stylish, I was envious of her pen and prose, the way she had the ability to create a set of mythical creatures, familiars, and make all of her main-characters feel real. Emma Day, and her cousins Penelope and Gretchen have a heart-warming friendship, and it's refreshing to see such a bond between literary-characters. They have clear personalities and traits, this is not a book where you have to flick back a few pages to find out who's perspective you are reading from or who's talking, it's clear from their personalities. You will never have as much fun reading about these girls; whether that's when Gretchen is arguing with her mother, or Penelope is reciting Shakespeare. Emma Day should be applauded for her determination as she's not one to phase easily. Even when she realises she has antlers on her head! She's got a feisty-personality that really helps to drive this plot, along with the fact she is extremely strong-willed. Penelope and Gretchen's friendship with Emma made possibly my favourite fictional-friendship - Gretchen's rebellious side makes her easily loveable, in a way where she is completely out-of-place at the balls that come with being a debutante. She hides in libraries - so, I must ask, can I character be anymore relatable? Penelope is sophisticated, smart and a person that connects with the reader. Cormac Fairfax, our love-interest, surprisingly has many-layers, a backstory you want to know, and reasons for his choices. Harvey doesn't just create the typical boy that all young girls will want to read about. Sometimes though, he does coincidentally turn-up, rather than Emma sorting through a problem. From suspicions raised by the Order, to discovering what Emma's mother did, and finding Greymalkin warlocks, this is not a book you can read at night! What it is though is an enjoyable and exciting blend of genres. The familiars, the spells, the family-history - there are answers to most of your questions. There are gargoyles lurking everywhere, Madcaps on rooftops, spells being broken. Of course, I'll say I didn't turn the first page and love it. It was quite slow to begin with, and hard to slip-into, and the writing was repetitive with some of the sentences and phrases. It is not too long but, more action in places would have improved the parts where I felt that my mind was drifting elsewhere. Thank you to Bloomsbury for providing me with this review-copy. This in no way affected my opinion on the book. Four Stars to the Cousins. Firstly, that book cover is beautiful! It is absolutely gorgeous; and thank you! This book definitely sounds like something I'd enjoy! Like I said on Twitter, glad you enjoyed it :D I've heard quite a few good reviews so I'm pretty sure I'll enjoy it. Shame it was quite slow to begin with but I guess not every book can be perfect. :P Penelope and Gretchen and Emma sound like great characters. I think you'd love it! If you pick it up, remember to tell me what you think! Yes, the Cousins are fantastic, every book-worm can relate to Penelope! I received an unsolicited review copy of this and although I tried the first couple of chapters it just isn't my sort of book. It seemed a bit ridiculous to me, the way there's a sudden earthquake, fire and frost and the girls don't seem to react to it except to stand around commenting on how 'well-muscled' the boys are. And then a star-nosed mole crawled out of a dead girl's chest and I laughed and put the book down. My copy was also unsolicited, and I do get what you mean about the beginning! The star-nosed mole was a surprise! I'm sorry you didn't like it! I'm not a big fan of romance books so, I think everyone has a genre that they just can't enjoy!